Wat Mai Suwannaphumaham on Sisavangvong street, was once the principle royal monastery, the residence of the chief Laotian Buddhist dignitary (Phra Sangkharat), and the repository of the 33″ high, gold alloy Buddha icon (Phra Bang), that Laung Prabang derives its name from. But Wat Mai’s religious and cultural significance remains undiminished, and the three day Laotian new Year festival, is said to atract thousands of pilgrims, who come to witness the ceremonial return of the Phra Bang, and the rituals surrounding it. The Wat dates back to the 17th century, but most of the present structure(s), including the fabulous gilded bas relief on the facade, depicting stories from the Ramayana and from Laotian daily life, were restored or rebuilt in the 19th century. Despite all that grand gilding on the facade, this monastery, with its mystifying placement of Buddhas in the altar, holds a special, almost spiritual appeal. Possibly heightened in our case, by the mesmerizing chanting that we stumbled upon one evening on our way to dinner. A glimpse of the sacred that we are unlikely to forget. Beautiful, I want to go here. Hope you do and soon Tommy 🙂 Luang Prabang is touristy, but still beautiful. Thank you KZ. Glad you enjoyed this. The thought of stumbling into such a special place and time took my breathe away, and made me tingle with awe (that sounds so clumsy!). Lucky you and great shots as ever Madhu! Thank you Patti! We stumbled upon the evening prayers on another evening. I think there is something deeply relaxing about rhythmic chanting, and in these surroundings, combined with the sound of children playing outside, it was just magical. Your photos are just magnificent! Grand beyond belief! Pingback: Weekly Photo Challenge / B4 Retouch: Grand (Valley Temple Gizeh) | What's (in) the picture? Wow! What a place… Laos is on my bucket list, but not sure if I’ll ever make it there…. The rear view was quite a surprise Jo. It helped that there was no one there at that hour. Grand indeed, Madhu. Technically I have been to Asia, but only scratched the surface. Every time I see your photos, which are gorgeous, and get a taste of the history of a place, which you do so well, I know I have to find the time and a way to got over there. I am always delightfully amazed at what I always learn from you Madhu, my sister! Thanks for sharing such beauty and knowledge…God bless you! Truly grand, I’d love to see it all. Strange to see a game of football taking place though! I was surprised too, but it was strangely comforting to hear them over the sound of the chants Gilly! This looks like a very interesting place to photograph. We hope to visit that part of the world in the next couple of years. Thanks for posting the pictures. You are most welcome John. Thank YOU for stopping by to share your thoughts. Amazing – the span and depth of Indian (Hindu) influence in SE Asia. My pleasure entirely Eric. The Hindu influence is indeed amazing, considering there was no prescribed evangelism, like in the case of Christianity or Buddhism. Beautiful! I would love to see this part of the world. Someday! Thank you Nicole. I hope you do visit someday. Wat Mai glows with so much radiance and energy. It evokes peace, calmness, a sense of well being, of faith blessed by the heavens. Beautiful post. Happy Holidays to you and your family. So beautiful – photos and words – as only you can describe a place and a feeling. That rear part of the altar is fantastic. It’s the atmosphere of the place…and I can hear the songs and prayers. Exceptional, as always. I feel so moved coming to your place and traveling with you. Thank you again for sharing. Thank you Cathy. Laotian temples seemed even more beautiful than the other Eastern temples I have seen somehow. Beautiful. And quite a blog too….updating my list of places to go to before I die. The believers have truly created a beautiful place to worship. Maybe that was the central one? Yes, it was that kind of place Amy. You don’t have to be religious to feel the spirituality. Beautiful Madhu – don’t you just love it when something like the chanting happens coincidentally and you’re there to see/enjoy it?! Great post! Thank you Tina! Yes I cherish these serendipitous moments from our travels. that first image has some fantastic details going on! craftsmanship like that is hard to come by nowadays. thanks for sharing. Thank you for reading. That was indeed a special place. My last visit to Laos was in the year 1995. My target destination was a project to be inspected up near the Chinese border in the north of the country. Communism had taken away the greatness of that countries past and it was mind boggling for me to see their version of a hospital in that town. I rode from the airport standing in the trailer attached to a three wheeler normally used for ploughing. Slow and bumpy over corrugated roads. The hotel was -5 star but food was excellent. I heard stories of people brainwashed in the most inhumane way by that era’s ruling class. What I saw was a far cry from the beauty you have shown us above but I suppose, like, Myanmar they did preserve an occasional great relic of the past. Being the Golden Triangle I can assure you I walked among the poppies, but did not use their product. That sounds like quite the adventure Ian! I can imagine life must have been hard during the worst of the communist era. I heard the government is relatively benign and more open these days, but just about. All that glitters is gold. Beautiful and impressive. Your photos really capture the moment and feeling, be it kids at play or the spiritual. Yes, the tourists have found LP, but it is worth a visit. Indeed grand. The chanting must have been haunting as you walked by to dinner. Lovely photos. It was magical Angeline. We stopped and spent a good while listening to them, and while watching the children at play. Looking at the stunning pictures of the Wat Mai Suwannaphumaham monastery one can well imagine the surcharge of spiritual energy present inside. Grand! Beautiful presentation of the divine and mundane at the same time. P.S. I can’t see well the details in bas relief. Is it feasing and worship or fasting and worship? What an insight… your visually supported wrte-ups are so well covered..makes an interesting reading..
Those are scenes of feasting Paula. And of temple festivals. 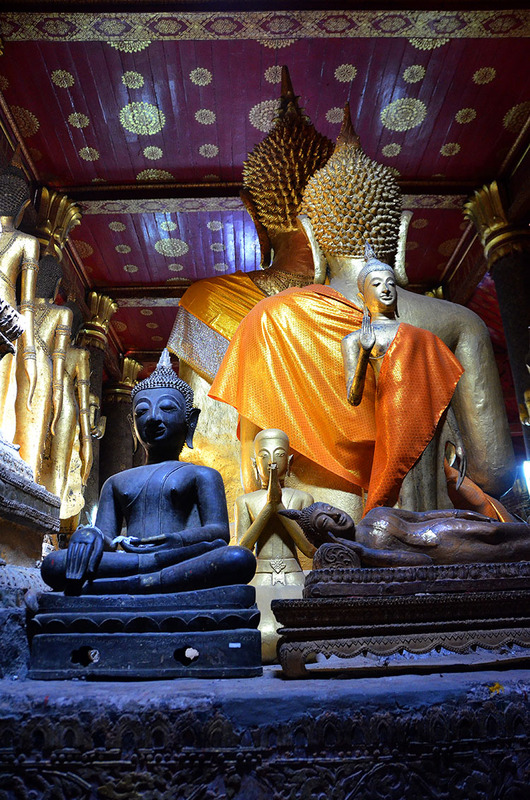 Madhu, your beautiful photos give me yet another reason to return to Luang Prabang. It feels as though Bama and I barely scratched the surface when we were there! Somehow we managed to miss Wat Mai completely, and we ended up skipping the Royal Palace in favour of lunch at Tamarind before a jaunt to the Tat Kuang Si waterfalls (which was a bit of a letdown). 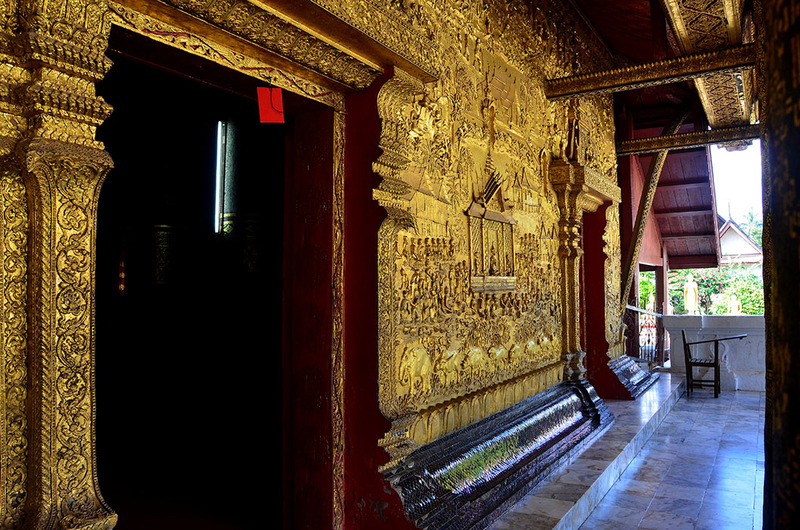 Wat Mai seems even more ornate than Wat Xieng Thong – and I would probably gaze at that gilded bas-relief for hours! Thankfully these two temples escaped destruction when the rest of LP burned in 1887. Wonderful story of the temple. The bas relief amazes me. Such extravagance we lavish on our gods.